You don’t go a day without eating—and you shouldn’t go a day without ThreeLac! Once you have obtained control over your digestive imbalance by taking regular dosages of ThreeLac and recovery pack items, it’s important to continue to supplememt daily with the #1 probiotic in America. GHT now makes it easier than ever to help you maintain this essential daily regimen with the availability of a new 30-day pack of ThreeLac at a better-than-ever price. GUARANTEED never to run out. GUARANTEED to enjoy ThreeLac at the most affordable price. 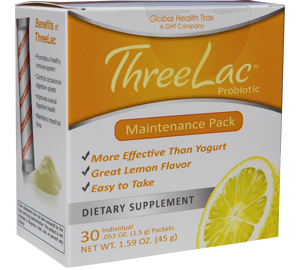 You’ll receive 30 sticks of delicious, lemon-flavored ThreeLac for just $23.95. This special offer is only available through the monthly auto order program. All you have to do is make an initial commitment to order for at least two consecutive months. Make a commitment to ensuring your good health and get started right away by calling GHT’s friendly and helpful customer support team at 1.800.305.5710. You’ll get ThreeLac delivered to your door automatically every month. You won’t have to remember to re-order. You won’t run the risk of running out. What could be more convenient than that?! And all for less than 80 cents a day. Just call 1.800.305.5710.